Ensure your slots by registering early! Shop for her books at this link. 2. Registration will start at 10:00 a.m. First come, first served. 3. 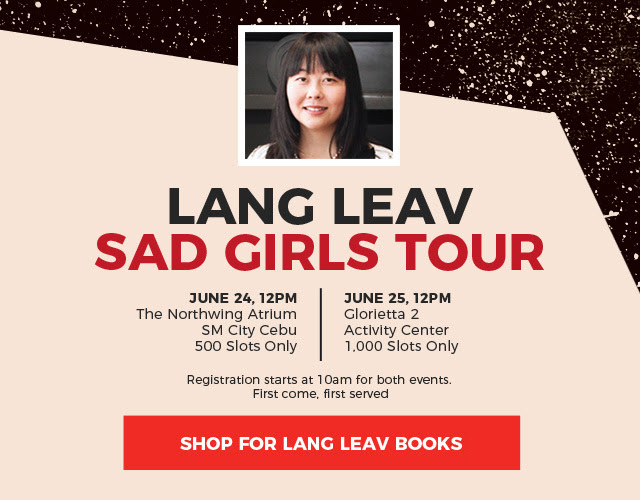 Each guest will only be allowed to have one (1) copy of Sad Girls by Lang Leav signed. 4. The book must be presented upon registration. Only copies of Sad Girls bought at any National Book Store, NBS Express, and Powerbooks branches will be allowed for the signing. The book must have its official receipt or price tag. 5. Other merchandise like t-shirts, posters, journals, notes etc. will not be allowed. the number of guests in line. 8. There will be an official photographer from NBS who will take your photo with the author. However, we strictly allow only one photo per guest.